The goal of any business is to succeed and you want your business to run as smoothly as possible. We offer templates you can download with ease and one of them you will want to be sure to download is the Petty Cash Request Template. It is a basic template that will help your business tremendously with regards to tracking those petty cash requests. Running a successful business means keeping track of what is going on within the company financially. This includes having a good system for keeping track of the money as it comes in and goes out. When you use our easy petty cash request template you will be able to keep track of the petty cash requests in an easy manner. The templates are straight forward and have spaces for all the pertinent information you are going to need in order to track petty cash requests for less than $50. It is a fast and simple way to track the requests and provides you with a simple form your employees can fill out. 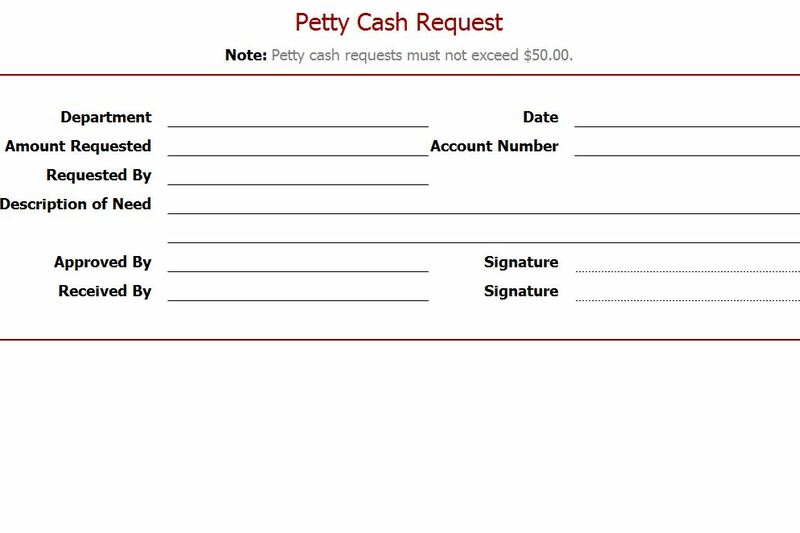 The petty cash request template can be downloaded here for free and has a general design that will work for any type of business. This template is also customizable so you can change or add any information which works best for your company’s needs. It is easy to use and downloading it right here allows you to print it out and begin implementing a simple and professional procedure for your employees with regards to requesting petty cash. This template is convenient and the fact that it is free is a huge plus. Customize the template easily so it fits your own business needs or even depicts your company’s name and any other information you want it to specify. Print out as many of them as you need so they are readily available to your employees when they need to make a petty cash request. Download the petty cash request template for free and make any customizations ahead of time. Then, all you need to do is print them out as you need more and they will be ready to go.